In the Main Menu, click Setup, Appointments, Appts Preferences. Alternatively, click Setup, Module Preferences, Appts tab. Here you can set default options and settings for the Appointments Module. Appointment preferences are divided into two tabs. Broken Appointment Automation: Determines what happens when breaking appointments. There are several options; you can select one or a series of actions. See Break Appointment. Broken appointment procedure type: Determines the procedure(s), if any, a user is prompted to add to the patient's chart when an appointment is broken. None: Do not prompt user to add any procedure. D9986: User will be prompted to add completed procedure D9986 (missed appointment). D9987: User will be prompted to add completed procedure D9987 (canceled appointment). Both: Give user the option to add a completed D9986 or D9987. Make broken appointment Commlog: Determines whether or not a user is prompted to enter a Commlog when an appointment is broken. Checked: Open the commlog window. Unchecked: Do not open the commlog window. Make broken appointment Adjustment: Determines whether or not a user is prompted to add Adjustments when an appointment is broken. Checked: Open the Adjustment window. Unchecked: Do not open the Adjustment window. Broken appt default adj type: Select the default adjustment type to assign to broken appointment adjustments. Only Additions (+) adjustments types can be selected. Time Arrived trigger: Select the confirmed status that will trigger an automatic time entry in the Time Arrived field on the Edit Appointment, and add the patient to the Waiting Room. Customize options in Definitions, Appt Confirmed (see Confirmation Status). Time Seated (in op) trigger: Select the confirmed status that will trigger an automatic time entry in the Time Seated field on the Edit Appointment window, and remove the patient from the Waiting Room. Customize options in Definitions, Appt Confirmed. Time Dismissed trigger: Select the confirmed status that will trigger an automatic time entry in the Time Dismissed field on the Edit Appointment window. Customize options in Definitions, Appt Confirmed. Search Behavior: Set the behavior for the Search feature (Pinboard). ProviderTime: Compares the needed provider time (indicated in the time pattern of the appointment) with available provider time (indicated by the time bar at the left of the appointment schedule), then returns the first available time slots for each of the next 10 available days. ProviderTimeOperatory: Uses the same search criteria as ProviderTime, but only returns time slots when the provider is available and the provider's operatory (or operatories) is available, for each of the next 10 available days. Appointment time locked by default: Set the default setting for the Time Locked box on the Edit Appointment window. Checked: The Time Locked box will default to checked, and added procedures will not automatically adjust the appointment time. Unchecked: The Time Locked box will default to unchecked. Appointment bubble max note length (0 for no limit): Enter the maximum appointment note length, in characters, that shows when you hover over an appointment in the schedule. If 0, there will be no maximum length and the appointment bubble will automatically resize to accommodate the entire appointment note. Filter the waiting room based on the selected appointment view: Determines which patients show in the waiting room. Checked: Only show patients who have an appointment scheduled in an operatory in the current Appointment View. Unchecked: Show patients scheduled in any operatory. Waiting Room alert time in minutes: Enter a value in minutes to flag patients whose wait time has exceeded this value. An entry of 0 disables this feature. If a value is entered, text color of patients in the waiting room will change to the waiting room alert color (below) when their wait time exceeds this value. Reset Calendar to Today on Clinic Select: Determines the date of the appointment calendar when a user changes the clinic via the Main Menu. Only visible when clinics is enabled. Checked: The date will reset to today's date. Unchecked: The date will remain the same. Add daily adjustments to net production: Determines if adjustments are included in the net daily production shown in the Appointments module. See Production Totals. Checked: The net daily production total will include adjustments. Unchecked: The net daily production total will not include adjustments. Force op's hygiene provider as secondary provider: Determines the default hygienist when scheduling an appointment in an operatory. Checked: The hygienist of the operatory is always assigned as the hygienist on the appointment, even if none. Unchecked: The hygienist of the operatory is assigned as the hygienist unless it is none. In that case, the patient's secondary provider is assigned. Appointment module production use operatories: Determines how the daily production value in the Appointments module is calculated. Checked: Calculate gross and net production based on the procedures in operatories that show in the appointment view. Unchecked: Calculate gross and net production based on the procedures attached to appointments for providers whose bars show in the appointment view. Appointments require procedures: Determines whether or not new appointments must have procedures attached. Checked: At least one procedure must be attached to an appointment before it can be created. Unchecked: Appointments can be created with no procedures attached. 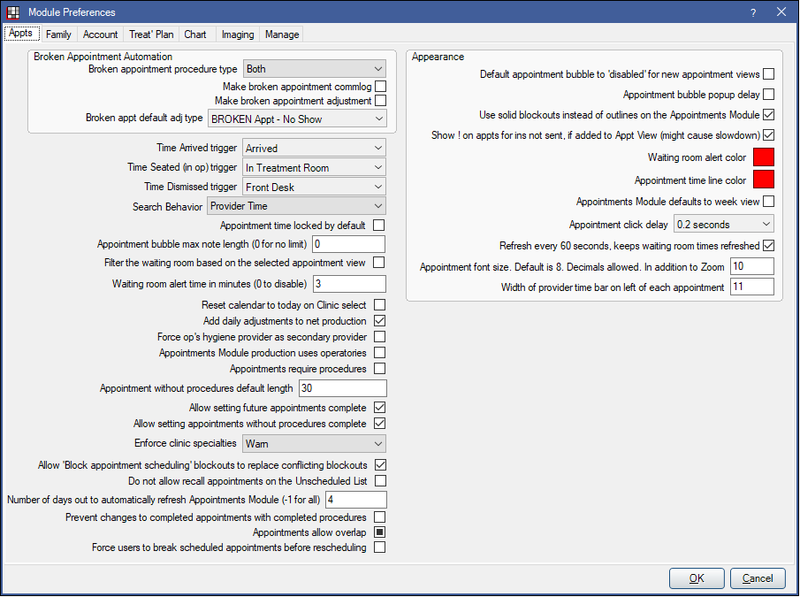 Appointment without procedures default length: Determines default length of an appointment when no procedures are attached. Allow setting future appointments complete: Determines whether or not appointments in the future can be set complete. Checked: Appointments with a future dates can be set complete. Unchecked: Appointments with a future date cannot be set complete. Allow setting appointments without procedures complete: Determines whether or not appointments with no procedures can be set complete. Checked: Appointments that have no procedures attached can be set complete. Unchecked: Appointments that have no procedures attached cannot be set complete. Enforce clinic specialties: Determines whether or not specialties are enforced when scheduling patients. Don't Enforce: Allow scheduling appointments in any clinic regardless of specialty. Warn: Warn user when scheduling a patient whose specialty does not match the specialty assigned to the clinic. Block: Block user from scheduling a patient whose specialty does not match the specialty assigned to the clinic. Allow 'Block appointment scheduling' blockouts to replace conflicting blockouts: Determines what happens to overlapped blockouts. Checked: Blockout types that have Block Appointment Scheduling checked will replace any existing blockouts it would overlap. Unchecked: Blockouts will not be allowed if they overlap an existing blockout. Do not allow recall appointments on the Unscheduled List: Determines whether recall appointments will appear in the Unscheduled List. Checked: Recall appointments cannot be sent to the Unscheduled list. Option to delete the appointment, or leave it where it currently is, will be displayed. Unchecked: Recall appointments are allowed to be sent to Unscheduled List. Number of days out to automatically refresh appointment module (-1 for all): Determines the number of days moving forward from today that signals are added to the database. This preference is useful for large offices who experience slowness in the Appointment Module. Default appointment bubble to disabled for new appointment views: Determines the default setting for Disable appointment bubbles check box when adding new Appointment Views. Unchecked: The Disable appointment bubbles box is unchecked. Checked: The Disable appointment bubbles box is checked. Appointment bubble popup delay: Set the behavior for bubble popups (if they are enabled). Unchecked: There will be no delay. Checked: A slight delay will prevent the bubble popup unless you intentionally hover over an appointment. Use solid blockouts instead of outlines on the appointment book: Determines the appearance of Blockouts. Unchecked: Blockouts will be outlined only. Checked: Blockouts will show with a solid background. Adding a procedure will cause the Broken Appointment Procedure window to open each time an appointment is broken. Show ! at upper right of appts for ins not sent (might cause slowdown): Enable or disable the exclamation point that shows in an appointment to indicate procedures have not been sent to insurance. For very large offices, enabling this option might slow down the Appointments module. The exclamation point does not show if a claim has been created for the procedure. Checked: An exclamation mark will show when any member of a family has procedures not sent to insurance yet. InsToSend[!] must also be added to the appointment view and there must be at least one completed procedure with an estimate waiting to be sent (within the last year). Unchecked: The exclamation point will not show. Waiting room alert color: Click the colored square to Color of text when a patient's wait time exceeds the waiting room alert time (set above). Appointment time line color: Click the colored square to select the color of the time line that shows in the appointment schedule. Appointment Module Defaults to Week View: Set whether the appointment schedule defaults to week or day view. You must restart Open Dental for this change to take effect. Checked: The default will be week view. Unchecked:(default) The default will be day view. Appointment click delay: Select a delay, up to one second, that will occur when a user double clicks an appointment to open it in the Edit Appointment window. The delay will prevent accidental adding or selecting of procedures within the delay time. Refresh every 60 seconds. Keeps waiting room times refreshed: We recommend keeping this checked so that the Appointments module is guaranteed to refresh a minimum of every 60 seconds. Also see Miscellaneous Setup, Process Signal Interval in seconds. Checked: The entire appointment module will refresh at least every 60 seconds. Unchecked: At a minimum, the red time line will refresh every 60 seconds.